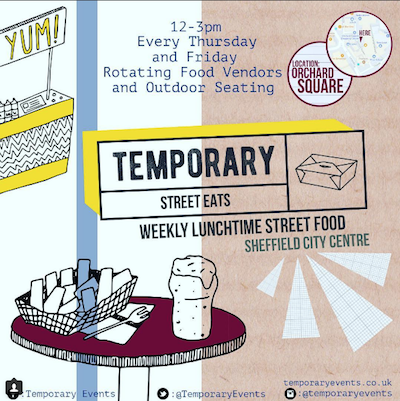 Lunchtime every Thursday and Friday 12-3pm we will be offering Street Food Traders in Orchard Square, Sheffield City Centre adding to our existing food retailers. Studies have shown that the world is a much happier place if people take the time to go out for lunch and get some fresh air. So, all you office workers, students, tenants and city centre dwellers, we are giving you that option. We have outdoor seating, decent music and of course some of the best food vendors around. We launch on the 2nd November at 12pm with The Al Fresco Pizza Company who will be with us every Thursday and Friday. We will also be getting in guest vendors to join us to offer you something new.